Drawing on the results of a Transparency International survey of more than 114,000 respondents in 107 countries, this blog addresses people’s direct experiences with bribery and their views on corruption in the primary industries in their countries. The findings are clear. Corruption is a very real burden, with more than one out of four respondents reporting having paid a bribe during the last year. When people are not in a position to afford a bribe, they might be prevented from buying a home, starting a business or accessing basic services. Corruption can, and often does, infringe on fundamental rights. For those surviving on less than US$2 a day, and for women who are the primary caretakers of children around the globe, corruption and bribery are particularly devastating. For them, the additional cost of bribery can mean trade-offs are made between health and hunger, between school entrance fees and the shoes necessary to wear to school. Not only do people pay the costs of corruption directly, but their quality of life is also affected by less visible forms of corruption. When powerful groups buy influence over government decisions or when public funds are diverted into the coffers of the political elite, ordinary people suffer. When there is widespread belief that corruption prevails and the powerful in particular are able to get away with it, people lose faith in those entrusted with power. As the 2013 Transparency International survey shows, corruption is seen to be running through the foundations of the democratic and legal process in many countries, affecting public trust in political parties, the judiciary and the police, among other key institutions. Importantly, however, the people surveyed around the world do not view themselves as powerless victims of corruption. They believe they can be part of the solution. In India, in 2011, millions of people marched to demand the establishment of an independent anti- corruption commission; in Brazil, a citizen petition led to the passage of a law which bans corrupt politicians from running for office. Citizen action can lead to the exposure of corrupt acts, the sanctioning of corrupt officials and pressure upon reluctant governments to do more in the fight against corruption. Bribery is widespread. Overall, more than one in four people (27%) report having paid a bribe in the last 12 months when interacting with key public institutions and services. Public institutions entrusted to protect people suffer the worst levels of bribery. Among the eight services evaluated, the police and the judiciary are seen as the two most bribery prone. An estimated 31 per cent of people who came into contact with the police report having paid a bribe. For those interacting with the judiciary, the share is 24 per cent. 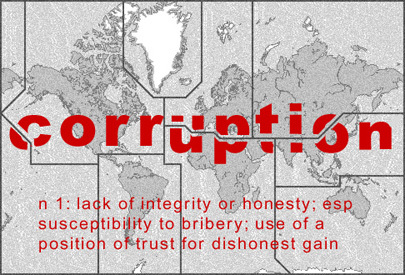 Governments are not thought to be doing enough to hold the corrupt accountable. The majority of people around the world believe that their government is ineffective at fighting corruption and corruption in their country is getting worse. The democratic pillars of societies are viewed as the most corrupt around the world, political parties, the driving force of democracies, are perceived to be the most corrupt institution. Personal connections are seen as corrupting the public administration People surveyed regard corruption in their country as more than just paying bribes: almost two out of three people believe that personal contacts and relationships help to get things done in the public sector in their country. Powerful groups rather than the public good are judged to be driving government actions. More than one in two people (54%) think their government is largely or entirely run by groups acting in their own interests rather than for the benefit of the citizens. People state they are ready to change this status-quo. Nearly 9 in 10 surveyed say they would act against corruption. The majority of people said that they would be willing to speak up and report an incident of corruption. Two-thirds of those asked to pay a bribe say they refused. Tomorrow we will look at the cost of corruption and recommendations as to how to limit it.